After the Supperclub this week I needed to find a recipe to use up a big tub of fresh chicken livers from the International Supermarket as we had loads left over from making the pate for the amuse bouche canapes. Chicken livers are not really eaten in the UK; I guess offal is not that popular at all. Chicken livers are acceptable in a pate or salad but not much else. According to my quick internet search chicken livers are a good source of vitamins A and B and minerals including selenium, zinc and iron and they are high protein and low in sodium. Like pork, lamb or calf livers they are high in cholesterol but they are still worth eating occasionally. I ate a pasta dish similar to this at Jamie’s Italian restaurant in Stratford Westfield recently, so knew there was a recipe out there waiting for me to experiment with. This turned out to be a flavoursome, simple, quick dish and it’s cheap too. A whole tub of chicken livers weighing over 1kg cost just £2.99. I only used half in this dish and it made dinner for 2 and enough to pack up and freeze for lunches for a couple days, so the chicken livers worked out less than 40p per portion. I adapted a recipe for Tagliatelle ai fegatini from an old Antonio Carluccio cook book ‘Passion for Pasta’ which was a recent charity shop find. Melt the butter in a frying pan and fry the spring onions and garlic very gently for 5 minutes until golden. Add the chicken livers and bay leaves, stir them around in the hot butter and fry for another 5 minutes over a low heat. Chop the mushrooms then add them to the livers and ham. Stir in the tomato purée, wine and chilli flakes and season to taste with salt and black pepper. If you used dried mushrooms add the soaking water if the sauce is too thick, if not just use a little hot water. Let the sauce gently simmer. 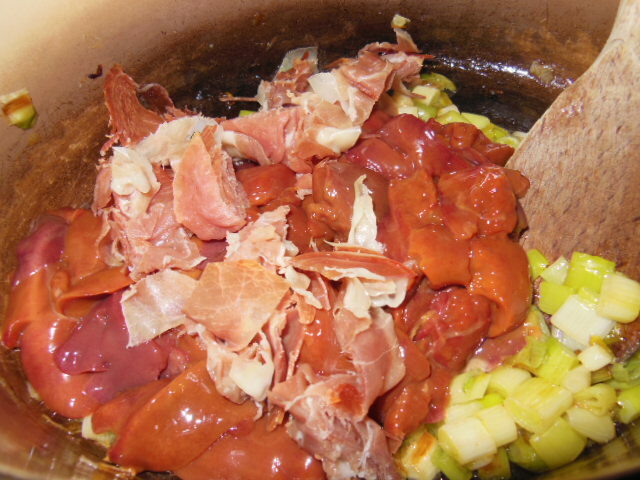 Meanwhile cook the pasta in a big pan, then drain, return to the pan and mix with the sauce. Remove the bay leaves before serving and sprinkle with parmesan. 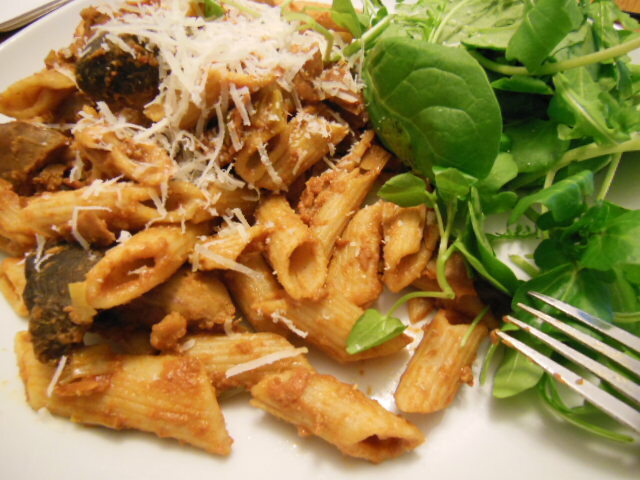 This entry was posted in Recipes and tagged Antonio Carluccio, Chicken livers, Cook, dried mushrooms, Liver, Passion for pasta, Pasta, proscuitto. Bookmark the permalink. I bet the chicken liver parfait is lovely too – Jamie recipes are great! One of the nicest bolognese recipes I’ve ever eaten had chicken livers in. I too bemoan the lack of availability of offal and cheaper cuts of meat in the UK. Yes you need to put a bit more effort into preparing and cooking them, but they have some of the best flavour.